A single white rosette on the top of the head is the 'crown' of glory for the White Crested Guinea Pig! Due to the stringent qualifications for showing the White Crested Guinea Pig, the majority of them are sold as pets. These pet animals may have non-conforming markings, but in most cases they still have the coveted crest on their heads. They also have the same sparkling personalities as other breeds of guinea pigs, even though some say their crest makes them look like they are perpetually angry. White Crested Guinea Pigs present quite a challenge to breeders, because as few as one in fifty of them conform to the breed standard. Although a showable White Crested is hard to find, those that have the correct markings often do well at shows. The White Crested Guinea Pig was officially recognized by the American Rabbit Breeders Association in 1974. The breed continues to be somewhat rare, however, probably due to the difficulty of producing offspring of show quality. Satin has been introduced to the breed, but are not acceptable according to ARBA standards. White Crested Guinea Pigs come in a variety of colors, but they must have a white crest on the top of the head. They should not have any white on the rest of the body if they are to be shown. True White Cresteds should have a short, smooth coat like that of the American Guinea Pig. White Crested's may also be found in Satin. This is a coat that is glossier and denser than the standard White Crested coat. White Crested Satins are not recognized by the ACBA. White Crested Guinea Pigs can be Agouti, Brindle, Self, or any other pattern that does not include any white. Dutch, Roan, Dalmatian, Himalayan, and White are not acceptable for show purposes. White Crested's of show and breeding quality are hard to find, but pet quality White Cresteds can be found with less difficulty. Prices are usually around $10 to $20 depending on quality. All you would normally have to do is put her in the ball. As she moves the ball rolls. You might have to do it a few times and go slow and be gentle or you will frighten her. OK let's try this with the little guy and the ball. Set the ball on the floor and in various places inside the ball put a little dab of peanut butter - just a little dab. I think she will like the peanut butter and want to lick the peanut butter which will make the ball move and she might get the idea. When she is done though make sure you wash the ball and rinc=se it really well. Gosh then I don't know. Just went online and saw the reviews you are talking about and does say dangerous but the balls they show are actual inclosures. The guinea pig can't go in and out as they want to. The ones I had were plastic but there were large openings 4 or 6 of them that the little guy could go in and out. I didn't know there were balls that you actually put the little guy in and closed a door. I don't think I would do that. I would be real reluctant to do that. You could frighten your little fella to the point where not a pet. Imagine someone stuck you in a big ball and then closed the door and this ball started to move around. You would be frightened. The one I had was more open and the little guy could go in and out as he please or roll it etc. He wasn't stuffed in it. I think best not to do that - certainly not with that kind of ball regardless if they advertise it as a toy. Scampers is getting bigger everyday....I think she's pregnant but, my mom said that she's not. And I don't know what to do. Anyways, how was your day? Anything exciting? PLEASE don't put your guinea pig in any wheels or balls. They aren't built for guinea pigs and guinea pigs can't handle them. Balls and wheels lead to serious back, neck, foot a toe problems. Guinea pigs have been known to not be able to walk and in some cases not even move after months of having used these products. PLEASE don't expose your guinea pig to this. Those balls can injure a piggie's back. I know I wouldn't want to be trapped in one of those balls. The poor little piggie is not built for a prison torture ball. Mentally it must be terrifying for them. Please throw the ball in the garbage. I have a gorgeous little fatty called Rocky! He is so placid and has a lovely nature! Very stubborn though lol doesn't swallow his medicine! I have a sweet little guy who gives me kisses and loves the pitbull who loves him. Hi, well my friend asked me to find out what breed her two guinea pigs are (Wish = hers, Scrappy ( my favourite ) = her brothers). I think Scaps is a White Crested! 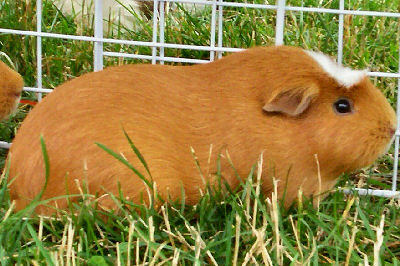 i would love to have your Guinna pig my pig just died and i am in 4h and i would love if i could find another one.